Home » Accounting Dictionary » What are Diseconomies of Scale? Definition: Diseconomies of scale represent the situation where the marginal cost of a product increases as the output increases. In other words, it’s a point in the production process where economies of scale reach their limit and start marginal costs begin to increase instead of decrease with additional production. What Does Diseconomies of Scale Mean? What is the definition of diseconomies of scale? DoS are related to a range of factors that pertain to a company’s performance. The increase in the output that a firm produces may lead to an increase in the marginal cost of production, thereby creating a diseconomy of scale. Reasons for the marginal cost to increase as the output increases may include a difficulty to control complex projects (managerial inefficiency,) bureaucracy, ineffective maintenance of equipment, lack of employee motivation (labor inefficiency), and ineffective mechanisms of cost control. All of these lead to the firm’s inadequacy to efficiently use its resources. As a result, rather than decreasing the costs and increasing the output, the firm experiences a higher marginal cost as the output increases. 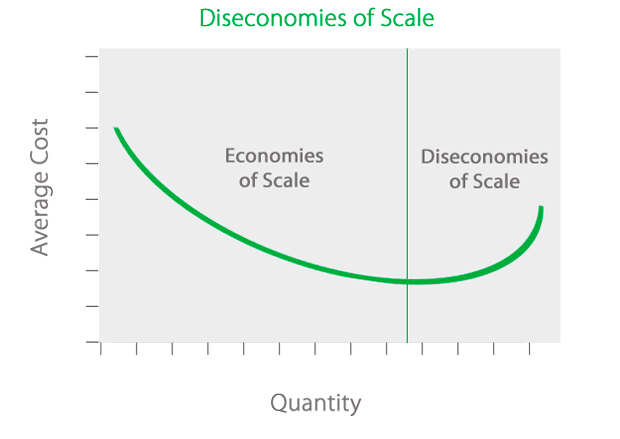 Diseconomy of scale is the opposite of an economy of scale. Take a look at the graph of each below. As the firm increases its output, it seeks to lower its marginal cost, i.e. the cost for each additional unit produced. In doing so, it will increase efficiency by utilizing its resources in the best possible way. Improved efficiency will lead to increased profits per unit. However, when there is a diseconomy of scale, the marginal cost rises instead of decreasing. For a quantity equals 4, the marginal cost (MC) starts to increase. At this point, the economies of scale become diseconomies of scale as shown in the graph below. Also, note that for a quantity equals 5, the variable cost increases, thereby increasing the total cost. The marginal cost is Change in TC / Change in Q, therefore as the total cost increases, the marginal cost increases too. At this point, the company must reconsider its cost policies and restructure its operations as it becomes an easy target for competitive companies that can acquire a larger market share or even buy out the company. Furthermore, the company should use an efficient technology that can improve the costs while increasing the output. 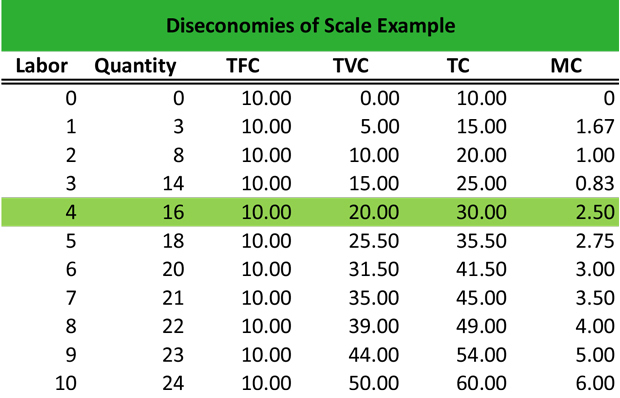 Define Diseconomies of Scale: Diseconomy of scale means a point in production where an increase in a production process does not lower the marginal costs of the next unit produced. 1 What Does Diseconomies of Scale Mean?